I’m not one given to pageantry. I have little time for pomp and ceremony. I dread networking events and am allergic to structured meet and greets. I abhor public displays of emotion (unless they’re focused on a rugby pitch or a green) and rarely get excited about anything to such a degree that said excitement is visible to others. And yet, today, on 1 March, I find myself in the oddest of moods. Yes, it’s St David’s day and for the Welsh, perhaps a reason to celebrate. But that’s nowt to do with my mood. What has my blood racing a little faster than usual is that it’s the first of March. 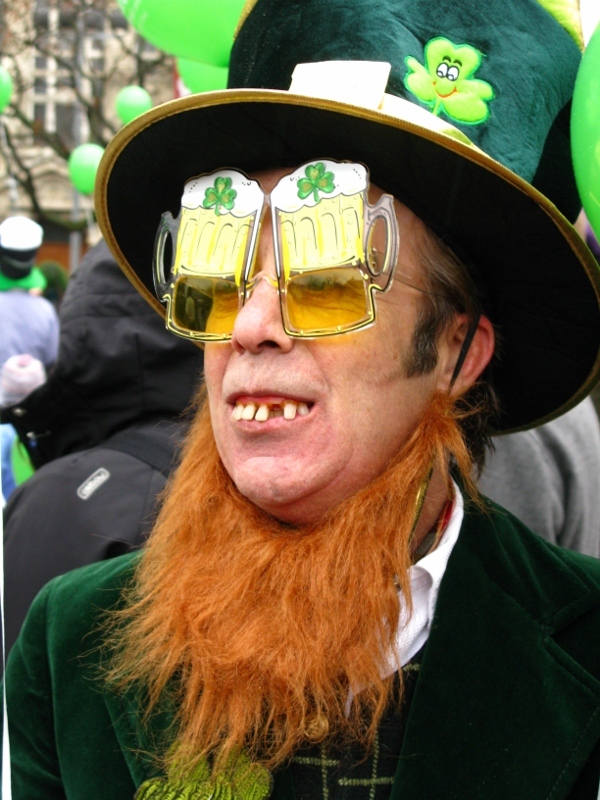 And, while I still can’t quite believe that I’m saying this, that means that Paddy’s Day is just around the corner. I know – shock horrors. 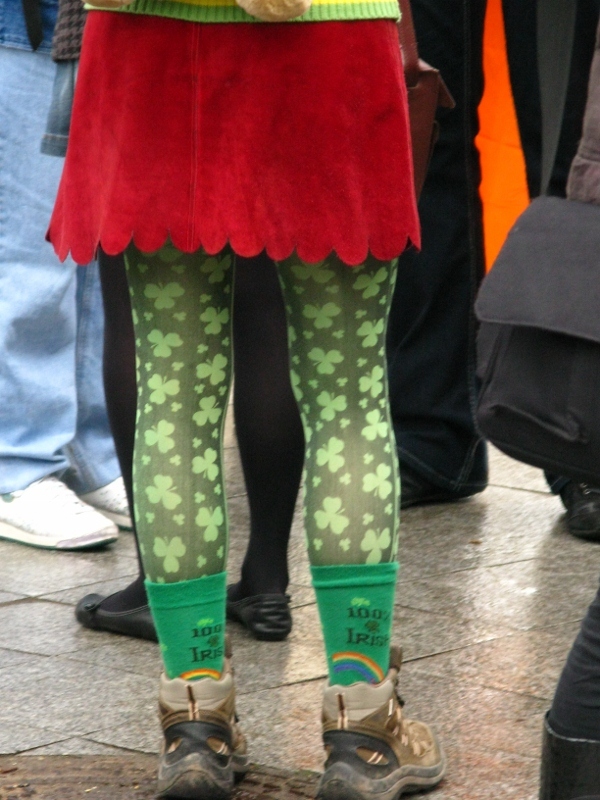 How uncool is it to be looking forward to Paddy’s Day for God’s sake? The sophisticated me is having a right olde barney with the kid in me. Regular readers may remember my public confession a couple of years ago to being a parade-pooper. And you might also remember my excitement (albeit it contained) at last year’s event. But even I’m surprising myself this year at how much I’m looking forward to the day. No, self-correct. Not just to the day, but to the week. And it all starts in just 14 days time! Forget advent calendars – surely there’s money to be made in a Paddy’s Day countdown. on the 13th just in time for the Gift of the Gab final on 14 March. This is going to be a sell-out. In fact, if you don’t get your ticket this weekend from the Caledonia Scottish Pub, you may not be there on the night to witness the fierce competition to see who will take home the GOTG 2013 trophy along with the accompanying kudos. The venue is the splendiforous New Orleans on Lovag utca and Friday is a holiday – so no excuse not to party. The two lovelies – Attila and Csaba – aka The Jookers will be on hand with special guests to get everyone out on the dance floor and dancing. Book me now if you want to boogie as my dance card is getting rather full! So, given that, in all likelihood, heads may be hurtin’ on Friday, what better place to recover than at the Irish Film Festival which kicks off at 4pm in Toldi Mozi. I went last year and it was a great event. Am waiting with bated breath to see which films will be screened this year. Jameson’s will be on hand to provide the hair of the dog to those who need it. And if that wasn’t enough, on Saturday night at Le Meridian, there’s the St Patrick’s gala dinner . This annual event is attracting some regular followers and with the best of Irish fare on offer, it’s a night not to be missed. Tickets are on sale now. If you’ve never danced an Irish jig, now’s the time to start. Of course, these events all lead up to the day itself – the day of the big parade. The day when Budapest goes green. 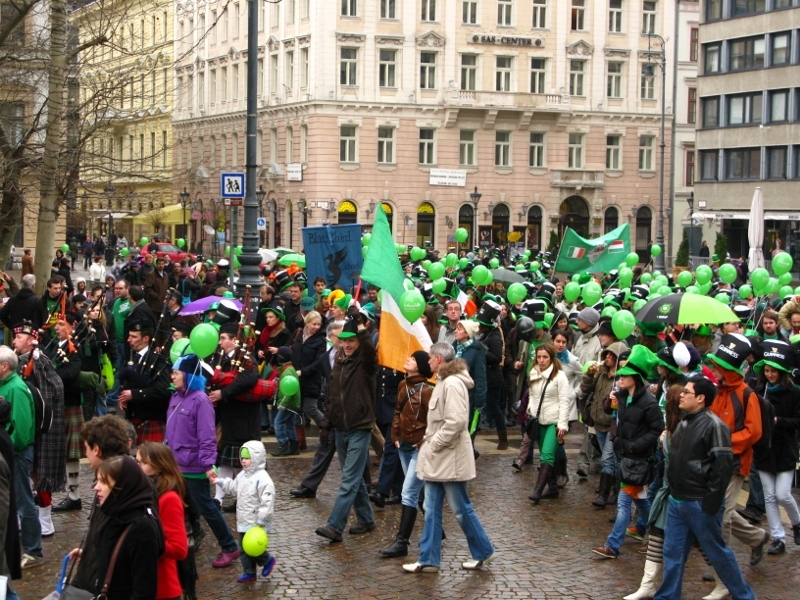 The day when leprechauns hit the streets and the world and her mother (and her granny) march to the tunes of pipe bands and wend their way from Szabadság tér to Deak tér for the last hurrah. Just under 1000 people (998 – I know, because I counted them) showed up last year and this year, we expect even more. According to the Facebook page, 400 are signed up already! As I was saying, I’m not one for pageantry, or pomp and ceremony, but there’s something about Paddy’s week in Budapest that warms the cockles of my heart and get my blood racing. You could almost mistake those photos for Dublin! Missing the parade this year, but have been at the Dublin one 2 years in a row which is remarkable for us!